Things are looking bleak for residents in the Syrian city of Aleppo and Iraqi city of Mosul. 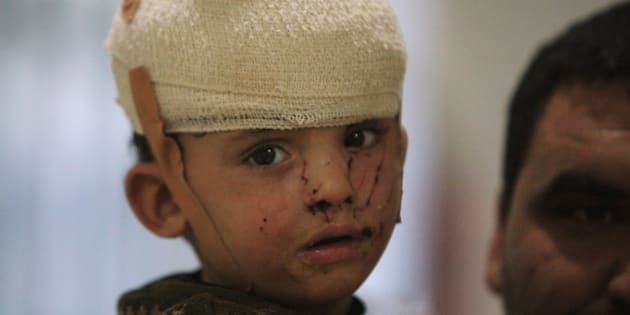 A displaced child who was injured in clashes and fleeing from Islamic State militants of Mosul, receives treatment at a hospital west of Erbil, Iraq. Mosul and Aleppo are separated by just 624kms miles and two very different wars. The ISIS held city of Mosul -- the terror group's largest stronghold in Iraq -- is the focus of an intense, bloody, drawn-out campaign by Iraqi forces to reclaim it after two years. It is a campaign with international support, and it's a campaign they appear to be winning. 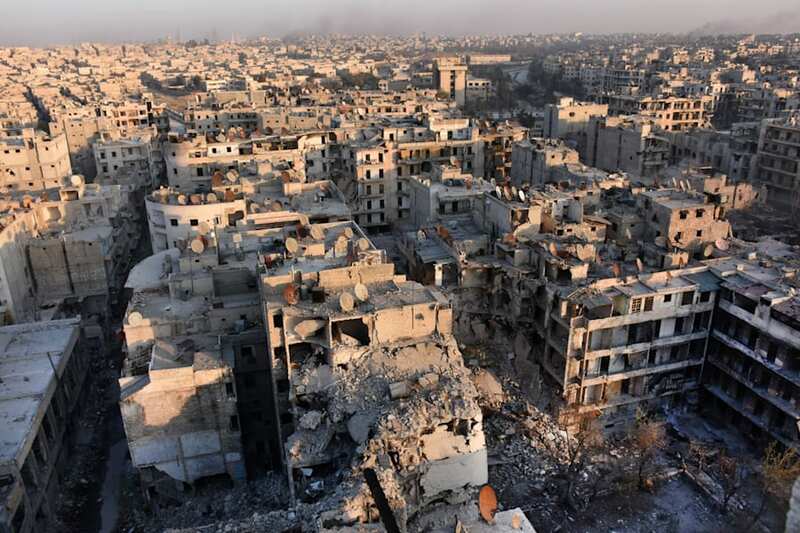 But the Syrian city of Aleppo, where the regime of Bashar al Assad has made significant advances in his campaign against rebels opposed to his regime, has been condemned by the U.N. as a "descent into hell" suffered by fleeing civilians. Map of Syria's Aleppo showing reported control areas as collated by The Carter Center, including recent clashes or violence in the city. A Syrian government soldier gestures a v-sign under the Syrian national flag near a general view of eastern Aleppo after they took control of al-Sakhour neigbourhood in Aleppo. 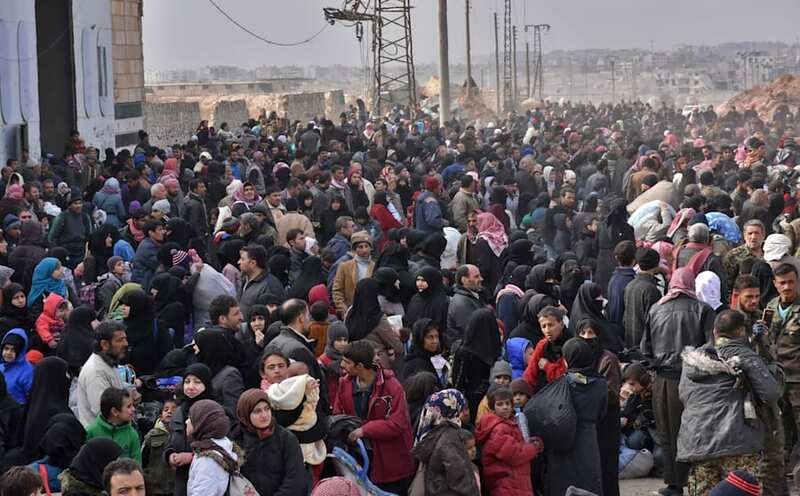 The United Nations on Wednesday voiced its alarm that up to 16,000 people have fled Syria's Aleppo city over the past few days, and warned thousands more will have no choice but to flee attacks spread and escalate. 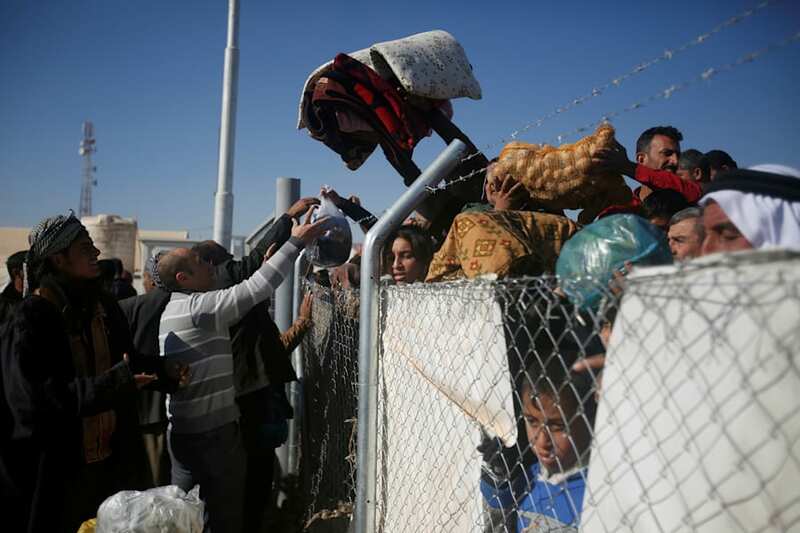 The International Committee of the Red Cross has said 20,000 people have fled the fighting in the past 72 hours. Aleppo has been the site of a sustained and bloody series of battles for four years, part of a civil war between the Russian backed Bashar al Assad regime and rebel groups opposed to the president's regime. Syrian government forces have captured more than a third of rebel-held territory in the city's east, a push which follows more than two weeks of sustained aerial bombardment in the area. The U.S. Ambassador to the U.N, Samantha Power, earlier in the month lashed the Assad regime and Russia for the military actions across Syria, and particularly in Aleppo. "Think of what you were doing Saturday," she said at a U.N. Security Council briefing on November 21. "Imagine being subjected to 180 airstrikes while you were doing it. Horrifying video from eastern Aleppo affirms a shocking inhuman barrage on civilian neighbourhoods." Hundreds of thousands of civilians are trapped inside eastern Aleppo. "The parties to the conflict in Syria have shown time and again that they are willing to take any action to secure military advantage even if it means killing, maiming or starving civilians into submission in the process," U.N. Emergency Relief Coordinator Stephen O'Brien said in a statement. The U.N. says another 700,000 people are in other besieged areas across the country, mostly in rural Damascus surrounded by Government forces. 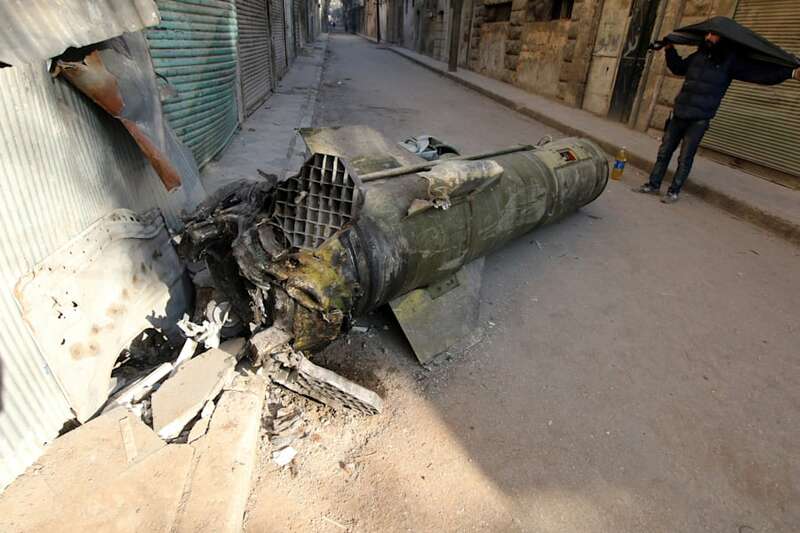 Aleppo, Syria's second largest city and a one-time commercial hub, is now broken and twisted. Most of its hospitals have been destroyed. Russia joined the military conflict in 2015, it has said to pursue Islamic terrorists. France has accused Syria and its allies of using the uncertainty of the U.S. election to launch "total war" against rebel held areas in Aleppo, Homs, Ghouta and Idlib. 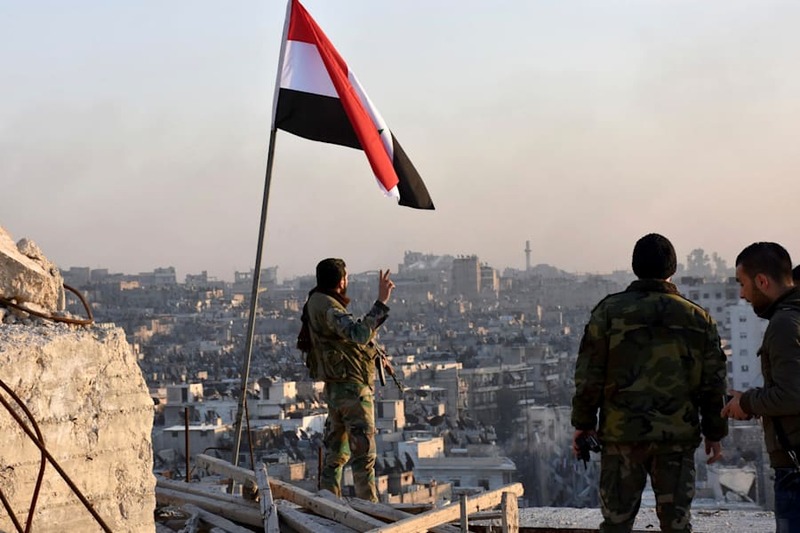 In a major breakthrough in the push to retake the whole city, regime forces captured six rebel-held districts of eastern Aleppo over the weekend, including Masaken Hanano, the biggest of those in eastern Aleppo. 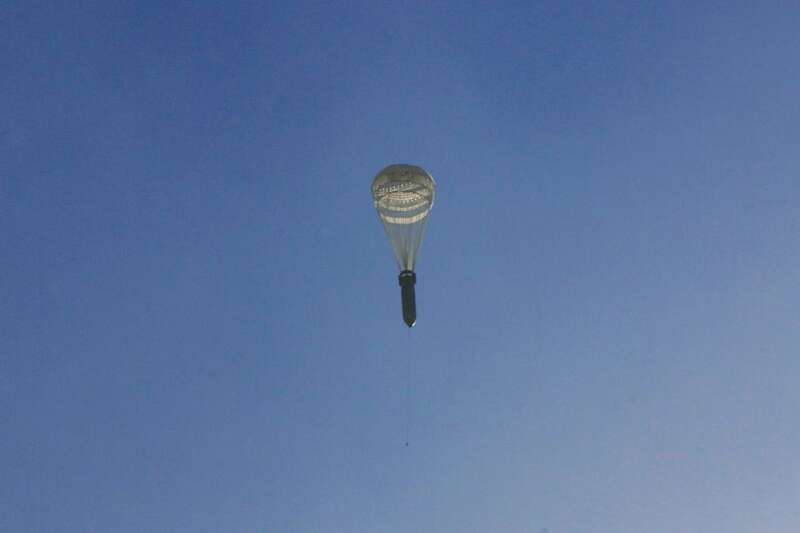 A missile hangs on a parachute while falling over the rebel-held besieged al-Qaterji neighbourhood of Aleppo, Syria November 28, 2016. Smoke rises from damaged buildings after an airstrike on the rebel-held town of Darat Izza, province of Aleppo on November 5, 2016. A joint inquiry by the U.N. and the Organisation for the Prohibition of Chemical Weapons (OPCW) found that Syrian government forces were responsible for three chlorine gas attacks in 2014 and 2015, and that Islamic State militants had used mustard gas in an August 2015 attack. In November, the U.N. voted to extend its investigation into chemical weapon use by one year. A meeting of countries opposed to Assad, including the United States, Saudi Arabia and Turkey, is expected to take place in Paris next month. However while there are expectations incoming U.S. President Donald Trump will strengthen ties with Russia, there is also potential for Aleppo to aggravate relations between between the U.S. and Russia. The U.N. Special Envoy for Syria expressed concern earlier this week that Assad could launch a new offensive to crush eastern Aleppo before Trump takes office on January 20. 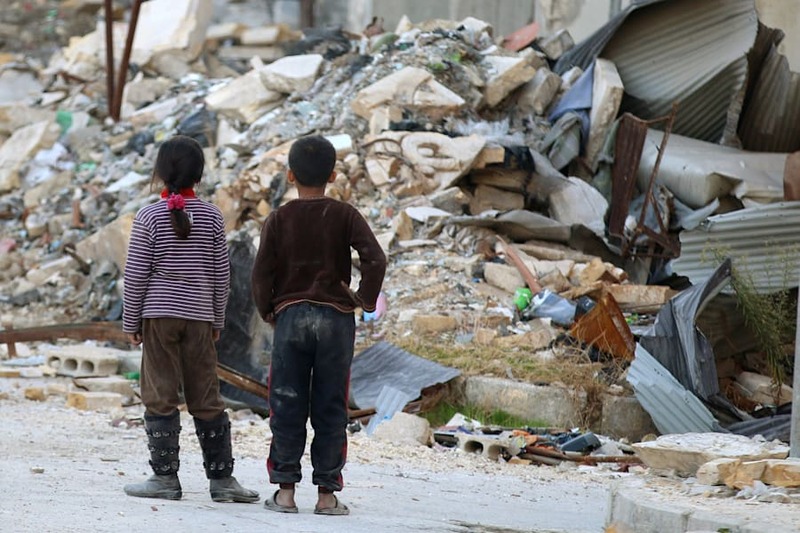 Aid group World Vision has said an estimated 11 million Syrians have fled their homes since the outbreak of the civil war in March 2011, with about 4.8 million having fled to Turkey, Lebanon, Jordan, Egypt and Iraq and and 6.6 million are internally displaced within Syria. About one million have requested asylum to Europe. 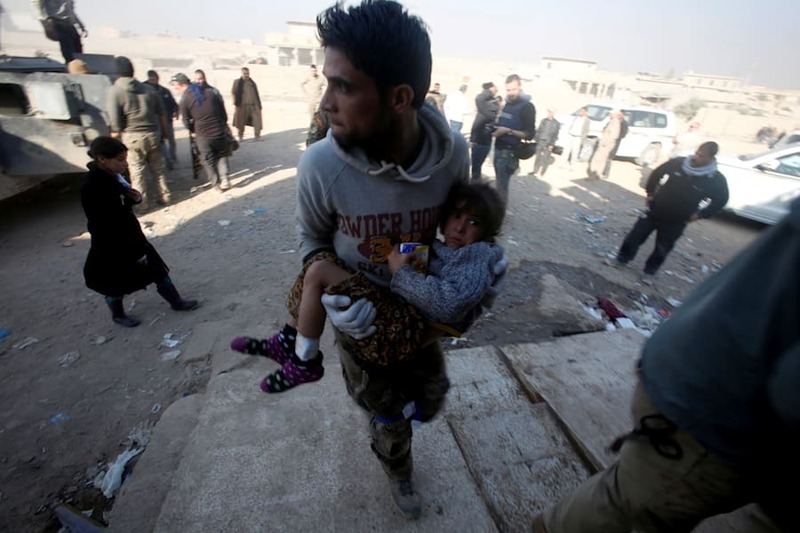 Mosul is facing a fresh crisis after more than six weeks of fighting, with news on Wednesday 650,000 people, or about a third of the besieged city, have been left without water after fighting damaged a key pipeline which is difficult to reach by repair teams. There are about 1.5 million people in the city. 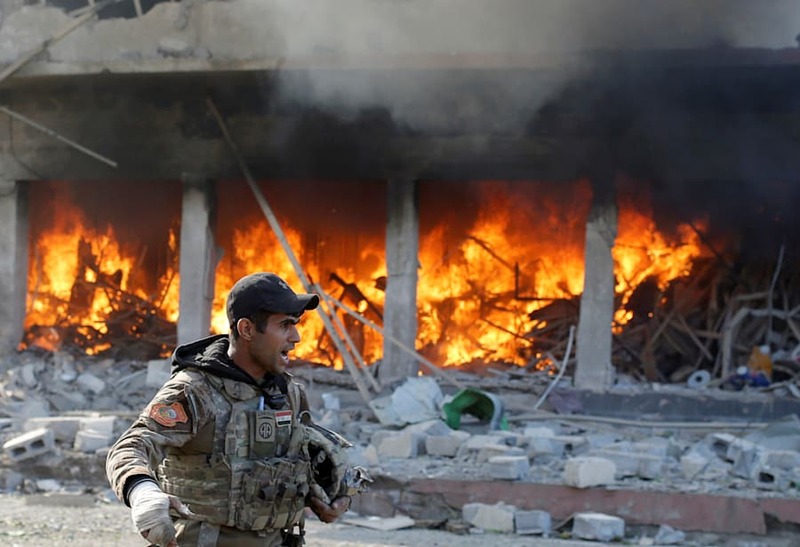 "We are facing a humanitarian catastrophe," a member of Mosul's Nineveh provincial council, Hussam al-Abar, told Reuters. "Basic services such as water, electricity, health, food are non-existent." The city -- which was seized by ISIS in a fierce 2014 blitz and now stands as the terror group's last stronghold in Iraq -- has been under siege from a coalition of Iraqi forces and Peshmerga fighters since mid October. Special forces troops entered the east of the city at the start of the month, but have made slow progress against entrenched ISIS fighters, car bombs and booby traps. "[IS] has been installing rocket launchers and placing snipers on the rooftops of civilian houses," U.N. high commissioner for human rights, Ravina Shamdasan, told the BBC on Tuesday. "Those who refuse to allow their houses to be used in this way are threatened or killed. These families are effectively used as human shields, placed squarely in harm's way, caught between IS and Iraqi Security Force fire responding to rocket and sniper attacks." 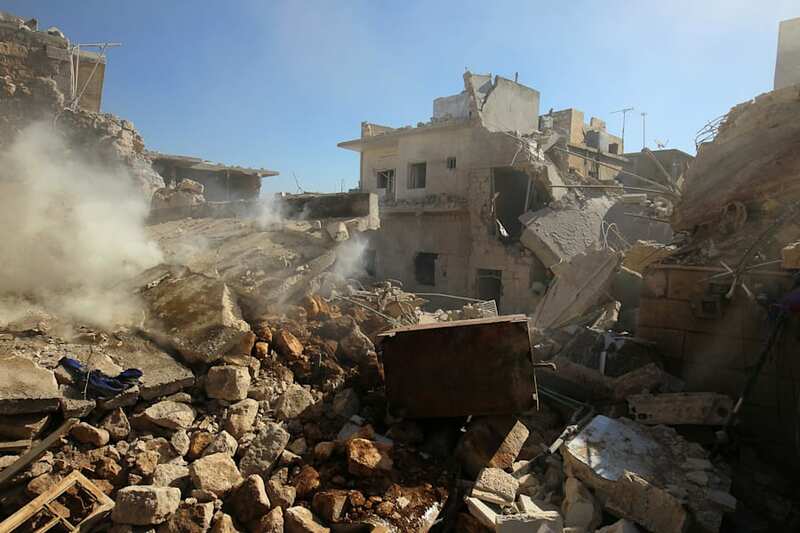 Reports of brutality have intensified amid reports IS militants shot more than 40 civilians dead in recent days, following earlier reports of mass graves found earlier in the battle. 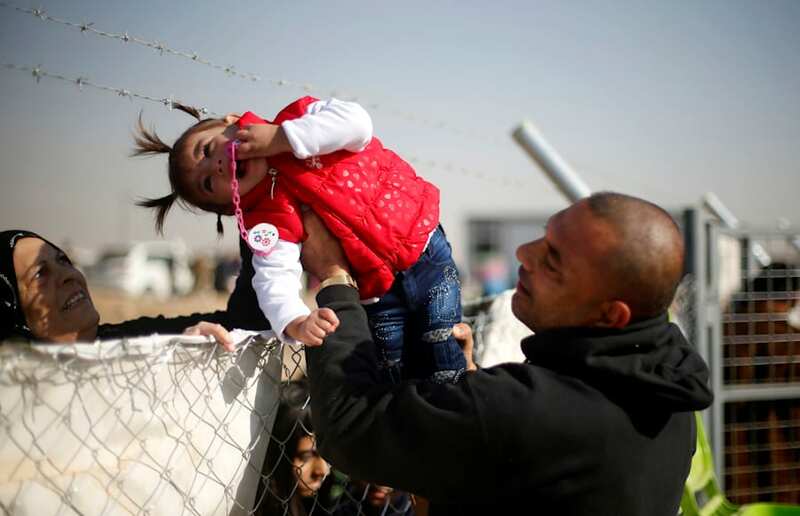 A displaced Iraqi man, who fled the Islamic State stronghold of Mosul, holds his daughter to be seen by her grandmother through a fence at Khazer camp, Iraq November 28, 2016. About 70,000 people have fled Mosul since last month's attack began, with many seeking refuge in camps equipped with the basic necessities for living. An Iraqi special forces member holds a position in an armoured vehicle in a recently recaptured district of southeast Mosul, on November 27, 2016. 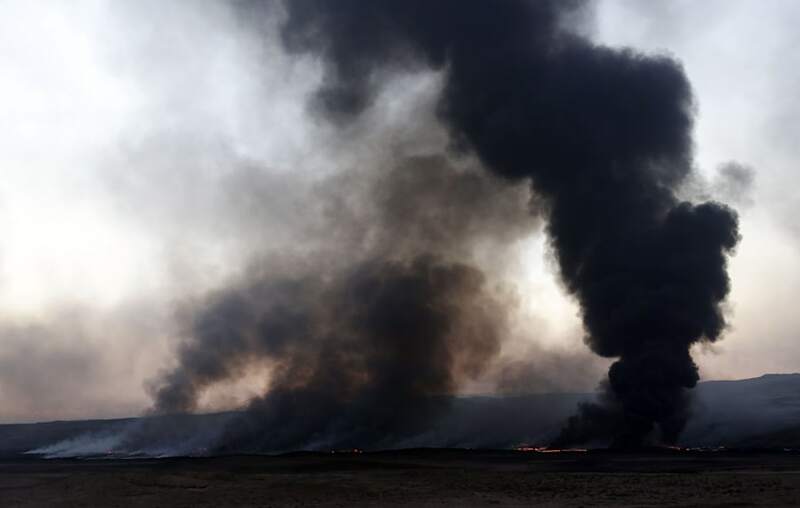 Smoke billows from a burning oil well, set ablaze by retreating Islamic State (IS) group's jihadists, in Qayyarah, some 60 kilometres (35 miles) south of Mosul on November 25, 2016. The campaign, which could take up to six months, is being hindered by about 6000 ISIS fighters -- mobile and hidden throughout the city. 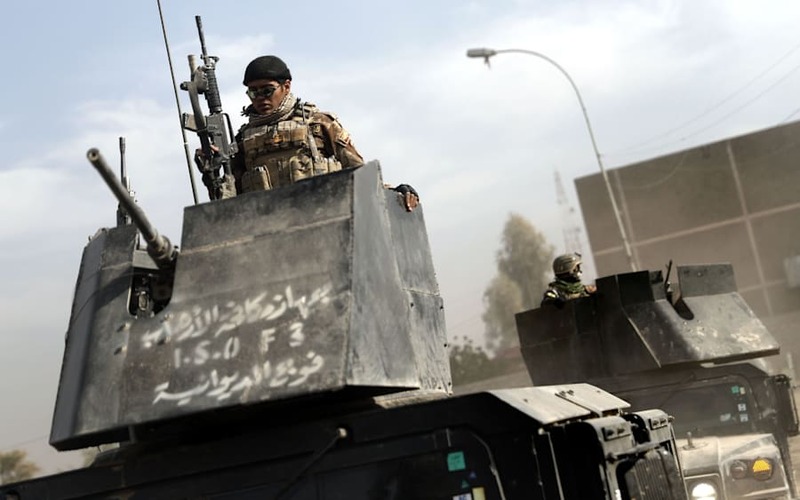 There are fears the alliances formed to defeat ISIS could eventually lead to the partition of Iraq, amid a push by the Iran-backed, Shi'ite-led Popular Mobilisation forces to take a bigger role in the offensive.